The title page in the The Pajama Game Playbill. George Abbott and Richard Bissell write the book to Adler and Ross' Pajama Game score about a couple caught in the middle of a labor dispute at an Iowan pajama factory. Abbott, with Jerome Robbins, directs the show which opens May 13 at the St. James Theatre starring John Raitt, Janis Paige and Eddie Foy, Jr. A young performer named Bob Fosse makes his Broadway debut as choreographer and Shirley MacLaine is one of his dancers. In the Playbill, among advertisements for cars (the "185-horsepower 'Rocket' Engine" of Oldsmobile's Ninety-Eight or the new standard "Safety Power Steering" of Buick's Roadmaster), women's fashion, the Hotel Astor in Times Square, Trans World Airlines, Tums, perfumes, cosmetics, cigarettes and plenty of alcohol is a half-pager for Playbill's "handy binder" for theatregoers who save their programs. 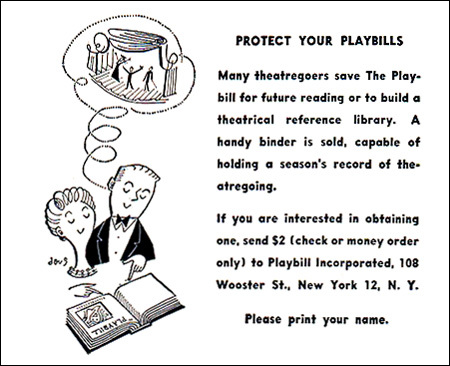 An ad for Playbill binders. Editorial featured in the Playbill is limited to a Eugene Burr-penned "The Theatre" column subtitled "Thereby Hangs a Tale" about those of theatrical professions who have caused scandal or crime and two articles on men and women's fashion. Filling out the Playbill is the signature "Who's Who in the Cast," the show's musical numbers and notes from the theatre's management: about personal property and how "Ladies are requested to remove their hats" during the performance. Management notes in the Playbill. The Pajama Game would vie for Tony Awards in 1955 and take home honors for Best Featured Actress in a Musical (Carol Haney), Best Choreography (Bob Fosse) and Best Musical. The work will then be adapted for the big screen in 1957 with Raitt, Foy, Jr. and Haney reprising their roles opposite Doris Day who took over the female lead from Janis Paige. Haney's understudy, MacLaine (who has gone on to film stardom), was discovered by a producer after subbing for the role's originator in a performance. Shirley MacLaine listed in the understudy page.